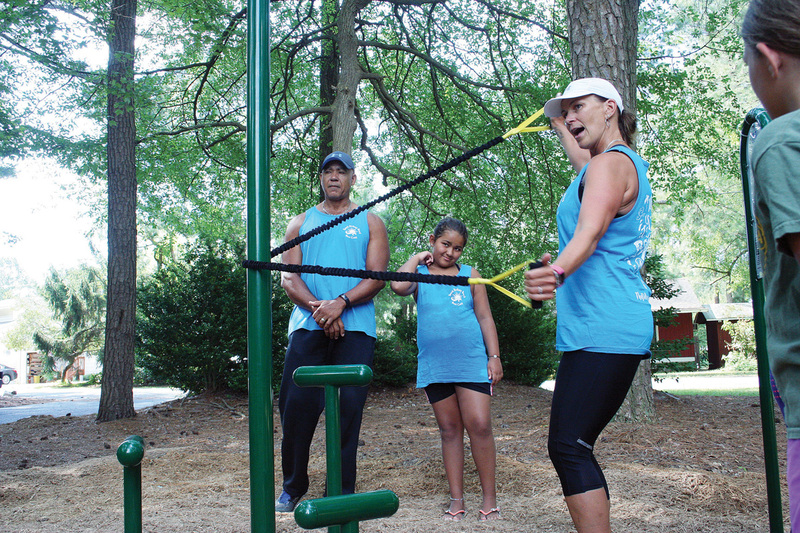 Kim Royster demonstrates an exercise at South Bethany's new fitness area, while her husband and daughter, Mel and Tory, look on. The adult fitness area includes spots for push-ups, sit-ups, balance beam and more. These seem like simple exercises, but the modifications keep things interesting. “We have a wide range of ages here … so we think what we’re doing will be good for everybody,” said Sue Callaway, town council member who helped spearhead the project. “Maybe after using the equipment, I’ll be ready for boot camp,” Callaway joked. South Bethany’s exercise bootcamp concession instructors, Mel and Kim Royster, helped select equipment and returned to demonstrate exercises at the grand unveiling on July 6, accompanied by their daughter, Tori. They gave advice, such as considering opening up instead of crunching into a ball when doing sit-ups, to help stretch the neck and spine. “Don’t push yourselves too hard, especially with being out in the heat,” Kim Royster said. “Never beat yourself up. Just move on. You’ll do better,” Kim Royster offered. People can add the equipment into a bigger routine by doing a set of 12 reps, then doing jumping jacks or walking a lap around the town triangle. The plan for the fitness area faced some scrutiny in council meetings, from the cost to the possibility of ticks among the trees. But the council approved the cost, and the Maintenance Department staff installed the equipment. In the future, they might invest in more equipment, officials said. The town’s Community Enhancement Committee led the charge for South Bethany to become “a healthy community,” a goal of the 10-year Comprehensive Plan. South Bethany Town Hall is located at 402 Evergreen Road. For more information, call (302) 539-3653.